The Chemical Guys Nifty Interior Detailing Brush scrubs dust, dirt, and debris from carpets, floor mats, and upholstery. This gentle scrubbing brush is made with an injection molded plastic handle and full-synthetic bristles that stand up to years of detailing use. Soft synthetic bristles with an ergonomic handle transfer powerful scrubbing action into the sensitive fabrics and light stains and contamination. Easily scrub and remove light dirt and grime,and pet, mud, grass, or food stains from interior carpets, seats, and floor mats. Flick out sand and pet hair after a trip to the beach or road trip with the family dog. Use the Nifty Interior Detailing Brush with Chemical Guys Nonsense All Purpose Cleaner to thoroughly clean dirt and stains from carpets and floor mats without adding any chemical odors. For super-tough set-in stains, scrub with Lightning Fast Stain Extractor. The Nifty Brush can be used on any automobile carpet, floor mat, trunk liner, and even on heavy-duty rubber all-weather floor mats. Use the Chemical Guys Nifty Interior Detailing Brush around the car, truck, RV, SUV, home, office, dorm room, and anywhere dirty carpets need cleaning! Use along with Lightning Fast Carpet & Upholstery Stain Extractor and Nonsense Colorless & Odorless All Surface Cleaner. Regular cleanings with the Nifty Interior Detailing Brush make dirty carpets and interiors a thing of the past. Simply mist the area with your favorite all-purpose cleaner or stain extractor, then scrub with the Nifty Brush. The tightly-packed bristles agitate dirt, debris, and stains from deep within sensitive carpet strands and lift them to the surface of the cleaner. Simply wipe up the mess with a clean towel, and enjoy the freshly-cleaned and restored carpet. Use the Nifty Interior Detailing Brush to clean old and sensitive removable floor mats, cloth seats, door panels, and any type of carpet throughout the car, home, office, dorm, and beyond. Scrub dirt, grease, grime, and stains out from any color carpet and freshen up floor mats in any car, truck, SUV, or RV. Brush embedded sand, pebbles, and rocks out from seats and carpets after a day at the beach or a long hike through the mountains with the Nifty Brush. The synthetic brush handle and bristles are chemical-resistant and work with any Chemical Guys cleaner, degreaser, and stain extractor. Scrub and clean any carpet and floor mat with the Chemical Guys Nifty Interior Detailing Brush. The Chemical Guys Nifty Interior Detailing Brush is designed and manufactured to clean all types of carpets and floor mats, and is especially well suited for cleaning old and sensitive carpets and upholstery. The brush features a short handle for direct scrubbing power on any carpets and fabrics. 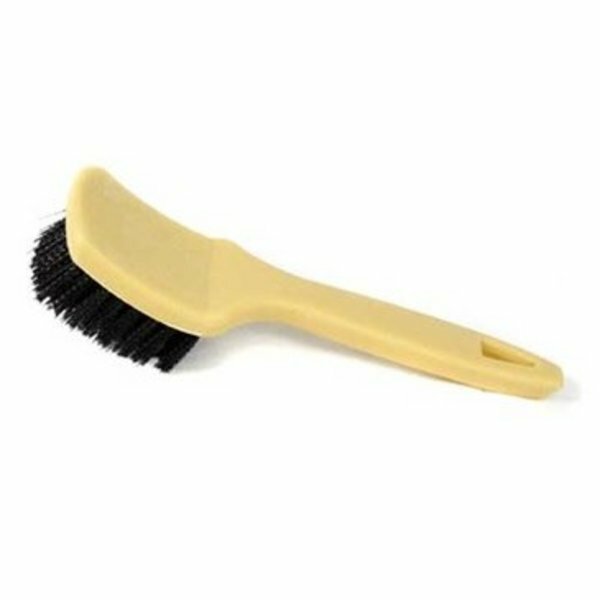 The injection molded handle is sculpted for maximum comfort and ergonomics, and creates a powerful and lightweight brush. Full synthetic bristles are packed tight into the scrubbing head and arranged for efficient scrubbing power with every stroke. The bristles are chemical resistant and work best with your favorite Chemical Guys all purpose cleaners, or heavy-duty stain extractors. The handle features a convenient slot to hang the brush up from when not in use, and rinses clean to avoid cross-contamination. Scrub away set-in stains, fresh spills, dirt, sand, debris, and grime with the Chemical Guys Nifty Interior Detailing Brush. The Chemical Guys Nifty Interior Detailing Brush works best with your favorite Chemical Guys all-purpose cleaner or heavy-duty stain extractor. For general carpet cleaning, try using Chemical Guys Nonsense. Nonsense is a colorless and odorless all-purpose cleaner that works wonders on upholstery, fabric, and carpet. Dilute Nonsense 20:1 for general interior cleaning jobs, or up to 10:1 for heavy duty stains and grime. If Nonsense can 't take down the stains, try switching to Chemical Guys Lightning Fast Stain Extractor. Lightning Fast breaks down set in stains and releases them from deep within carpets and fabric. Lightning Fast is very strong, so dilute it 20:1 before use on carpets or floor mats. Simply mist a few sprays of your favorite cleaner on the carpet or floor mat, let sink in for a few seconds, then scrub and agitate the area with the Nifty Brush. Scrub back and forth, then side to side with the brush to loosen dirt, debris, and stains, then draw them to the surface of the cleaner. Wipe up and blot the loosened debris with a microfiber or terrycloth towel. For best results, use the Nifty Interior Detailing Brush during the pre-treatment stages before using a hot water detail extractor to vacuum out every bit of dirt and debris with hot water.